An article accepted for publication in “The Astrophysical Journal” reports the discovery of a type Ia supernova, cataloged as SN 2015 cp. A team of astronomers led by Melissa Graham of the University of Washington used observations made with the Hubble Space Telescope and others to study a binary system in which a star that could be a red giant ejected huge amounts of materials and a part reached its companion, a white dwarf, causing its explosion. The supernova SN 2015 cn occurred about 545 million light years away from Earth and the Ia type occurs in binary systems in which there’s a white dwarf. In this case there was a typical white dwarf, also called a carbon and oxygen one for the elements that compose it, but the presence of a companion prevented it from slowly going towards its destiny, which more and more seems to be its crystallization, instead it exploded after having devoured large amounts of materials. Melissa Graham’s team tried to give an identity to the exploded white dwarf’s companion to try to better understand what mechanisms can cause a type Ia supernova. To do that they examined the remains of SN 2015 cp in 2017, 686 days after the first detection of the supernova, looking for hydrogen, which can’t have arrived from another white dwarf. 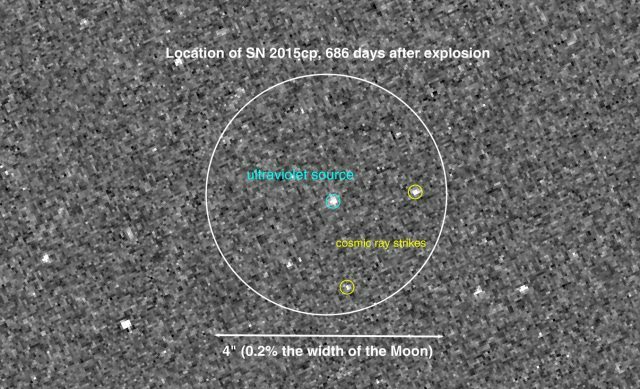 The researchers examined the ultraviolet emissions of 70 other type Ia supernova remnants between one and three years after the explosion to understand how to find it in the remnants of SN 2015 cp. The Hubble Space Telescope detected the ultraviolet light indicated in the image (NASA / Hubble Space Telescope / Graham et al.) of debris composed of hydrogen, also confirmed by follow-up observations conducted with various instruments such as the Swift Space Telescope, the Keck Observatory in Hawaii, the VLA in New Mexico and the VLT in Chile. The presence of those debris indicates that the companion was a red giant or something similar that ejected huge amounts of materials. Perhaps it was at the beginning of the red giant phase, in any case those materials reached a speed estimated around 10% of the speed of light making it shine at the ultraviolets detected almost two years after the supernova. SN 2015 cp seems a rare case since the comparison with other type Ia supernovae indicates that no more than 6% of the exploding white dwarfs have that type of companion. Melissa Graham is also a scientific analyst at the Large Synoptic Survey Telescope (LSST), which in the future will be used to automatically detect ultraviolet emissions similar to those of SN 2015 cp to discover the remains of other type I supernovae. This will make it easier to obtain much more information about them, a significant factor in their study. These supernovae are considered important by astronomers because they have a constant brightness that makes them useful for various cosmological studies such as those concerning the expansion of the universe, dark matter and dark energy. For these reasons, it’s a type of research that is growing and that now can benefit from the use of many telescopes.